Ellen McKenzie guards Lana Merchant during a recent Maine Senior Women's Basketball practice. While the NBA season doesn’t start for a few weeks and the WNBA season is wrapping up soon, a group of women is hitting jump shots and setting picks on basketball courts in southern Maine. The players range in age from 50 to 74 years old, and as they prepare for the Maine Senior Games this weekend, there is no sign they are slowing down. At the Memorial Middle School gym in South Portland, some players are dribbling basketballs while others are lacing up their high-tops. These aren’t schoolkids but women in their 50s, 60s and 70s, and they are warming up for basketball practice. “I’ve been on a keyboard at a computer all day long, so I just try to do work with my hands and get them loosened up. Then I just try to do some wall passes,” says Deb Smith, 63, of Portland, the coordinator of the Maine Senior Women’s Basketball league. Included in the group of about three-dozen women are teachers, coaches and nurses, even a retired opera singer. They meet a few times a week to practice and scrimmage together. “We’re not gonna line up and run those little wind sprints that you used to run, because, I mean, people have injuries. So you do what you can do,” Smith says. Deb Smith, 63, of Portland is the coordinator of Maine Senior Women’s Basketball. 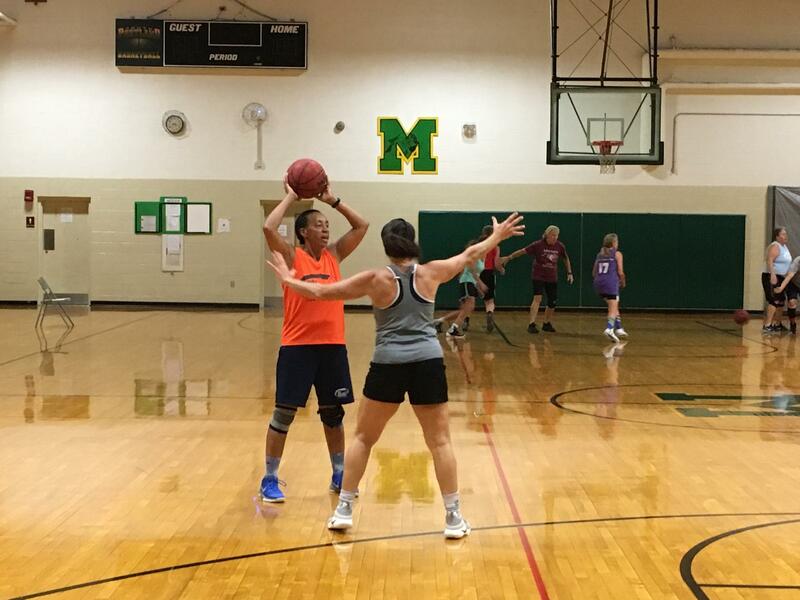 Smith has a lifelong passion for the game — she played at the University of Maine at Orono in the mid-’70s, coached school teams and has run a “Not Too Late” basketball camp. She has been part of Maine Senior Women’s Basketball ever since she became eligible at 50. The women practicing together here are grouped by age into teams when it comes time to compete at state tournaments and at the National Senior Games. The oldest team, the Pioneers, are 70- to 74-year-olds. But there’s no getting around the minimum age to play ball. “I have three women who are just waiting to turn 50 years old, and it does run counter to what our society tells us,” Smith says. Ellen McKenzie has played basketball ever since she can remember, with her siblings and through high school. She’s now 53 years old, and she started playing competitively again after a 15 year hiatus. “It was really exciting because I think for a lot of people, once you’re out of high school, if you don’t play college ball, you think that’s it,” she says. 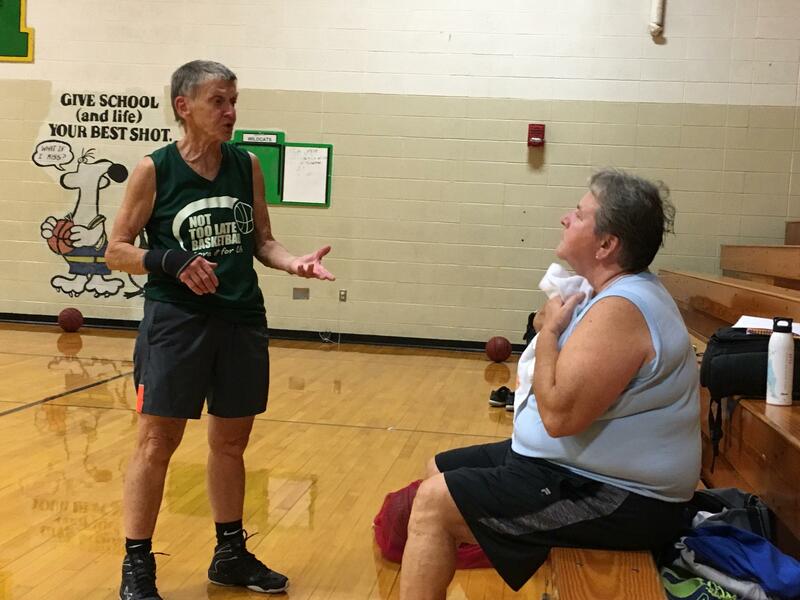 Linda Hunt (left), 70, of Hollis talks over strategy with Deb Smith at a practice. McKenzie is normally a guard, but because the games are half court and three-on-three, she takes on multiple roles. She also wears knee braces — one for arthritis and one she has worn since middle school for support. “And maybe a little fashion as well,” she says. Studies show that as people age, the benefits of an active lifestyle can reduce the risk of heart disease, stroke and blood pressure. But a 2015 national poll of adults 50 and over found that only 20 percent had played a sport in the past year. And among those adults, only 5 percent of women said basketball is what they played most often. McKenzie says she once had a doctor try to discourage her from playing. “Because I was getting hurt. He loved the fact that I played, but didn’t like to see me as often. But that’s part of the sport. And the more active you are, the quicker you’re gonna heal,” she says. Ginny Bishop, a retired opera singer who lives in Southport, didn’t play for decades and returned to the game just last year. Ellen McKenzie (left) during a recent Maine Senior Women's Basketball practice. “I wish I’d known what I know now when I was playing in high school. You’re not doing it for money. And you’re not trying to get a scholarship, and you’re not trying to impress your parents. You’re just playing for the love of the game,” she says. 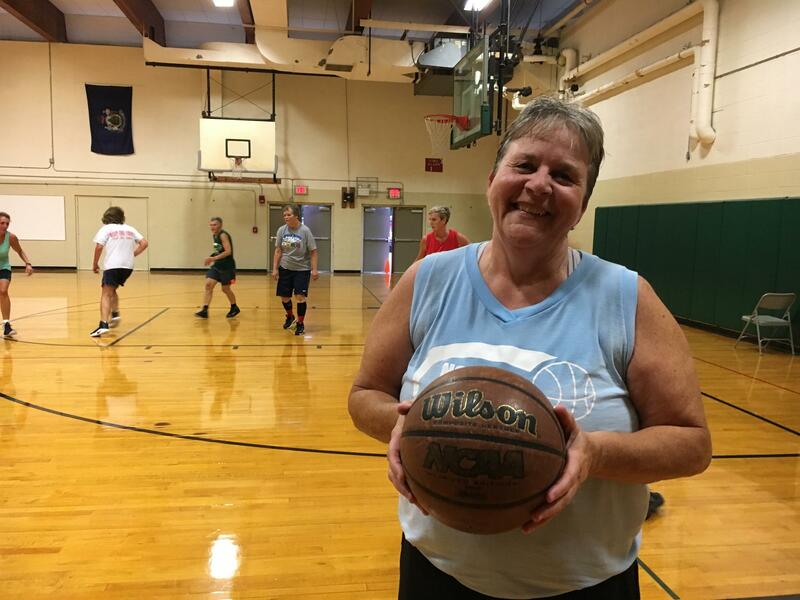 For 70-year-old defensive powerhouse Linda Hunt of Hollis, participating in Maine Senior Women’s Basketball for the past two decades has special meaning. Title IX, a 1972 law that requires that women and men be provided equitable opportunities to participate in sports, did not kick in until 3 years after she graduated from college. “It just felt like, finally, I could do what I wanted to do when I was a teenager and didn’t get a chance to do, and now I’m doing it,” she says. Hunt says playing three times a week with the Pioneers, the over-70 team, keeps her sweating and feeling young. She says she has also been surprised that she has improved her game. Even so, people still ask about injuries. “‘Oh, aren’t you afraid you’re going to get hurt? Oh I can’t do that,’” she says. Even though many of her teammates wear knee braces, have had broken fingers, broken hands or broken ankles, Hunt says, they get past it and play. But in their advancing age, the women on the league also know how to support each other through personal loss, both on the court and off. That includes the loss of teammates to cancer, and loss of siblings and parents. “It’s a friendship fellowship — a group of women who care about each other, who help each other out in times of need and good times and bad times,” Smith says. But the same tender sentiments might not be on display this Sunday when the women compete in the Maine Senior Games. Even though the women are friends with opposing teams, Smith says the mood is competitive. “So it’s a hug before the game and it’s a hug after the game — but when the game’s going on between the lines, there are not gonna be many hugs,” she says. The Maine Senior Games basketball tournament is Sunday, Sept. 24, at Cape Elizabeth High School. There will be teams from the Northeast and Maine. The next National Senior Games will be held in Albuquerque, New Mexico, in June 2019. This story was originally published Sept. 22, 2017 at 5:43 p.m. ET.